Todd Swain started climbing in 1975 in New Hampshire and wrote his first climbing guidebook in 1978. He has since written guidebooks to major areas such as the Shawangunks in New York (the Gunks) and Red Rock National Conservation Area near Las Vegas, Nevada (Red Rocks). 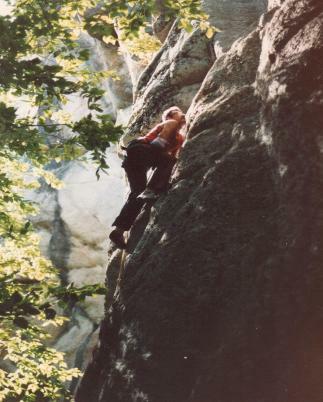 Left: The first ascent of Mystery Achievement (5.11+) at Band M Ledge in New Hampshire in 1987. Since 1975, Todd has climbed throughout the United States (29 states and counting), as well as in Antarctica, Argentina, Belize, Bolivia, Bosnia-Herzegovina, Bulgaria, Cambodia, Canada, Chile, Colombia, Croatia, Ecuador, England, France, Greece, Italy, Jordan, Laos, Macedonia, Mexico, Montenegro, Morocco, Serbia, Slovenia, Scotland, Spain and Thailand. He has pioneered many new rock and ice climbs in Alabama, Alaska, Arizona, California, Colorado, Connecticut, Maine, Massachusetts, Nevada, New Hampshire, New Jersey, New York, Pennsylvania, South Dakota, Tennessee, Texas, Utah, Vermont, and Wyoming. Internationally, he has completed new climbs in Belize, Bosnia-Herzegovina, Bulgaria, Chile, Colombia, Croatia, England, Jordan, Laos, Macedonia, Mexico and Scotland. Starting pretty late in the game, he has thus far attained 21 of the US state high points. Another fun fact: Todd has collected a paycheck on all seven continents! 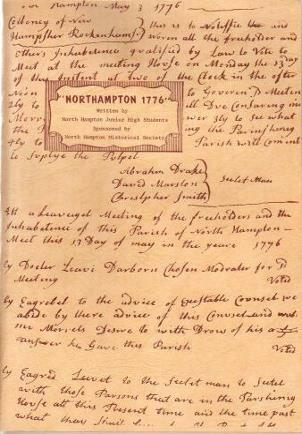 Left: A school project on the status of North Hampton, New Hampshire in 1776. This booklet, which Todd co-authored, was completed in preparation for the country’s upcoming bicentennial.